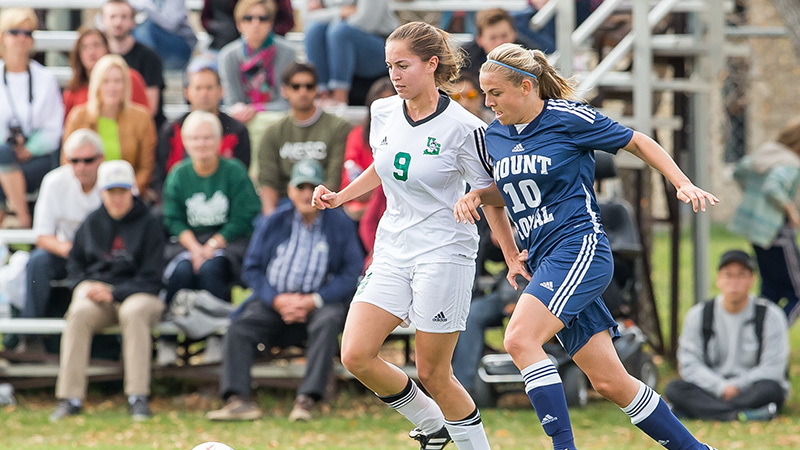 Student-athletes at the U of S have a multitude of demands to meet. They have to manage a full course load, maintain a high level of academic performance, manage their schedule, maintain peak physical condition, and travel to games. Not to mention practice, practice, practice. With a schedule like this, there is virtually no time for a student to take on a part-time job to cover costs. Now imagine the challenges that come with being a student-athlete who plays two different sports. This is a reality for Julie Labach, a finance major and a track and field and soccer star for the Huskies. However, thanks to the generosity of U of S donors through the Annual Campaign for Students, Labach’s rigorous but rewarding schedule is not compromised by cost. Labach’s competitive spirit is not only on display in a debate, but also the track and the pitch. Despite never having run track before attending the U of S, Labach has competed in a variety of events, including running as part of the 4 x 800m relay team, which finished seventh at the CIS Championship. She is also a striker for the Huskies soccer team. Soccer has been a passion for Labach since she was five years old. She has also trained extensively with the High-Performance Development Centre throughout high school, honing her skills. The scholarships that Labach has earned include an entrance scholarship, a scholarship through the Edwards School of Business and the Huskies Athletics Opportunity Matching Award, which rewards excellence in athletics and academics. Read more about how the Annual Campaign for Students here: http://words.usask.ca/donornews/.